This page displays the current information for the DIR-628. It will display the LAN, WAN (Internet), and Wireless information. If your Internet connection is set up for a Dynamic IP address then a Release button and a Renew button will be displayed. Use Release to disconnect from your ISP and use Renew to connect to your ISP. If your Internet connection is set up for PPPoE, a Connect button and a Disconnect button will be displayed. Use Disconnect to drop the PPPoE connection and use Connect to establish the PPPoE connection. General:Displays the D-Link router’s time and firmware version. WAN:Displays the MAC address and the public IP settings for the router. LAN:Displays the MAC address and the private (local) IP settings for the router. Wireless LAN:Displays the wireless MAC address and your wireless settings such as SSID and Channel. LAN Computers:Displays computers and devices that are connected to the router via Ethernet and that are receiving an IP address assigned by the router (DHCP). The D-Link router automatically logs (records) events of possible interest in it’s internal memory. If there isn’t enough internal memory for all events, logs of older events are deleted but logs of the latest events are retained. 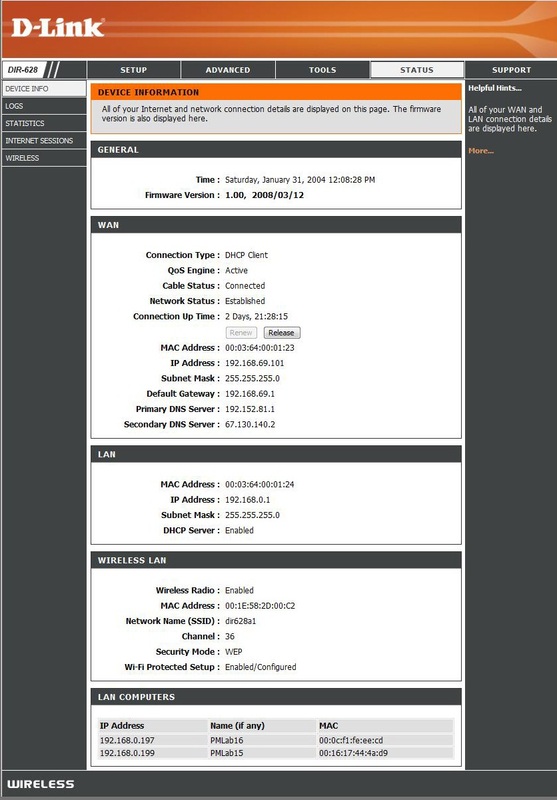 The Logs option allows you to view the router logs. You can define what types of events you want to view and the level of the events to view. This D-Link router also has external Syslog Server support so you can send the log files to a computer on your network that is running a Syslog utility. What to View:You can select the types of messages that you want to display from the log. Firewall & Security, System, and Router Status messages can be selected. View Levels:There are three levels of message importance: Informational, Warning, and Critical. Select the levels that you want displayed in the log. Apply Log Settings:Will filter the log results so that only the selected options appear. Refresh:Updates the log details on the screen so it displays any recent activity. Clear:Clears all of the log contents. 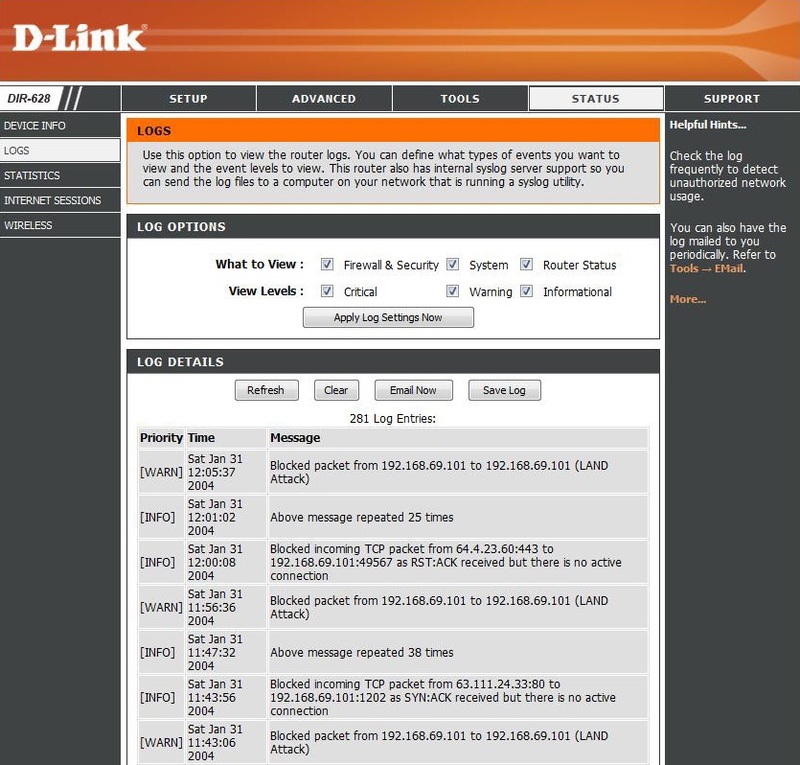 Email Now:This option will send a copy of the D-Link router log to the email address configured in the Tools > Email screen. Save Log:This option will save the router to a log file on your computer.